Second game - into the depths again. So Wei-Fang and his new friends managed to return safely to the village and the wizard him self to his order. Fearing he would fail the test because they didn't manage to clear out the dungeon, he was pleasntly surprised when he passed the test. 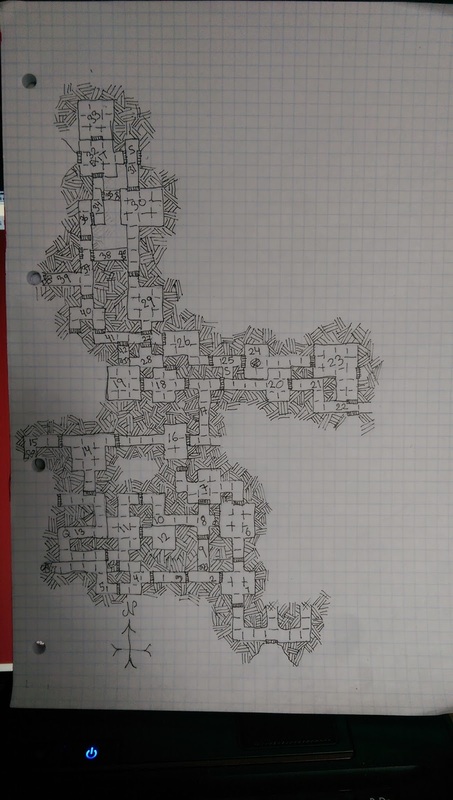 None of the teachers had counted on the dungeon being so large and the amount of spells and other items found more than enough made it up for not clearing it completely. Also killing two minor dragons was considered quite a deed. As the students were allowed to keep everything they found Wei-Fang sold the gems and jewelry landing 680 gold pieces in addition to the 427 gold pieces they had found as well. He also sold two scrolls of escape, keeping one, giving him an extra 200 gold pieces. They now had 1307 gold pieces to share amongst them. Now properly graduated from The Order of the Whitestar, Wei-Fang is tasked with investigating another dungeon not far from the village. Recent studies have indicated that an old artefact "Book of Eternal Death", a necromancer book, might be hidden within its depths. Wei-Fang accepted and went to the inn to ask his friends if they were willing once more to travel with him. Without hesitation they accepted. They decided to just pool all their loot and buy whatever they needed. Any surplus gold would be stored in Wei-Fangs room in the Whitestars tower to be kept safe. First they invested in 3 extra bandages so they all had a set. Ichabod upgraded to a sword (but kept his knife) and added a bow to his armory. Katarina also bought three potions of healing adding to her overall healing capabilities. They also bought an extra lantern just to be sure. After shopping they returned the 967 gold pieces left over in a box in Ichabods room and headed out for the next dungeon. [*] This includes the scrolls and staffs Wei-Fang has brought with him from the previous adventure. As I proceed, I will use scrolls and staffs/wands before Wei-Fangs normal prepped spells. After a few ours walk from the village up into the nearby mountains they managed to find the cave Wei-Fangs superiors talked about. Behind bushes and covered in moss a huge double door revealed it self to them. Uraq and Katarina had to work hard to get it open but finally managed to push them in revealing a rectangular room that extended to the north. Wei-Fang lid up the lantern and stepped into the room. Some old torches that had long since been working hung on the wall and on the floor scattered bones and pieces of wood could be seen. Not finding anything of interest he stepped forward and saw that he was in a corridor leading east and west. He turned to look back at his friends. "Uraq, Katarina, will you take the point again? We shall be heading west." As usual, the fighters lead their steps into the dungeon followed by Wei-Fang and Ichabod. The corridor continued west and looked unused. Nothing were lying on the floor, nor did they see anything on the walls. Wei-Fang considered searching the corridor for anything interesting, but deemed it to be too close to the entrance to actually be worth the effort. He urged them to continue along the corridor and they turned north then east again. The corridor continued east with a door leading south and at the far end another door leading north. Like the previous part of the corridor, this stretch was also empty although the air was getting more and more stale. Sticking with his "choosing left first" theory, Wei-Fang nodded at the door to the south. Uraq pushed the door open and revealed a short corridor and a wall of collapsed stone and rock. He shaked his head at Wei-Fang and closed the door after him, before he headed for the door at the end of the tunnel. With a loud creak the door opened revealing yet another corridor leading north and after a short turn east and then north ended in a door. Once more Wei-Fang decided against search the corridor further. He was certain that the treasures would be hidden in a room further into the dungeon. The corridor continued north and Uraq and Katarina trodded along in the light from Wei-Fangs lantern. Turning east and then north they were almost surprised to see 5 hobgoblins around the corner, but without hesitation they charged the group. While surprised only one hobgoblin fell to Uraqs attack, the others easily dodged Katarinas. Still startled by the sudden attack none of the hobgoblins manage to hit Uraq or Katarina. Uraq snarled at the hobgoblins and pushed his sword through the stomach of one, while Katarinas mace crushed the heads of two of them. The last hobgoblin steeled his nerves and attacked Katarina but she brought her shield up and deflected it while Uraq rammed his sword through the side of the beast dropping it to the floor. Searching through their remains they only found 8 gold pieces in all. Not much to bring home, but the dungeon was yet fresh and could reveal more. Stepping over the bloody corpses of the hobgoblins Uraq and Katarina leads the party further along the northern corridor that ends in a small room with a door to the north. On the eastern wall there's a small altar which Katarina begins to examine after slinging her shield onto her back. At the moment she touches it a pain runs through her hand and arm and she falls to her knees. After a moment she regains her composure and tries to ready her shield again. It doesn't take her long to figure out that something is wrong with her arm and she fears she have been cursed. Not wanting to take any chances so early in the adventure she blesses her self and feels relieved when it seems that a darkness leaves her arm and leaving her as good as new. They take a few minutes to get a bite to eat and drink, before Wei-Fang got up and nodded to the door. "Ok, lets get on with it!" Uraq opens the door and when the lantern lits up the other side a new corridor opens up for them. A few steps in there is a t-section with another corridor leading east. Wei-Fang considers going east, but returns to his original plan and points to the corridor leading north. The Corridor continues for some time before making a turn east followed by a turn north. Once more there is no sign of anything and Wei-Fang begins to wonder if his fellow wizards have led him on a wild goosechase or if he should begin searching every part of the corridor for hidden doors and the like. But he decides to continue and then revert to a proper search if nothing reveals it self later on. They follow the corridor and ends up in a round room with a door on the oppsite side of the corridor. In front of the door is a skeleton in armor and on each side there are two more skeletons dressed in the same way. The moment Uraq sets his foot on within the circle the room makes they begin to shamble towards the adventures. Uraq and Katarina smiles grimly at each other and attacks. A moment after 4 skeletons have been smashed to death but the last one continues towards Katarina as if nothing happened. She blocks the attack with her shield and then annihilates the skeleton by smashing her mace downwards through is skull and further through the chestbones. Armor and pieces of bone flies every where while she smiles with grim satisfaction. And grrrrrrrrrrrrrrrrrrrr I forgot the +1 bonus again!!!!!!! Not that they needed it at all, but still!!! Oh well - if I haven't used them in this adventure, I will just discard them. Ichabod steps into the room watching the carnage. Besides the shattered remains - the room is empty. He nods at Uraq who is about to open the door. At first he can't open it, until he discovers that it opens into the room. He yanks the handle and has to jump back as stone and rocks comes tumbling out. Obviously a collapsed part of the tunnel system. Wei-Fang scratches his head and sighs. "Ok, my friends lets go back to the t-section and see what we can find." They walk back in silence through the empty tunnels and turns east at the t-section and soon they are at another t-section with a corridor going north and a door to the south. Once again left is chosen. As they proceed they can see that the tunnel is going straight ahead. On the left there is a doors and on the right side at the end there is also a door leading east. Not wanting to move a way from his principle Wei-Fang points at the first door on the left side. Uraq opens the door which wakes up 5 fungi folk. Knowing they are poisonous he attacks them before they can ready them selves and kills two in his first strike. Katarina charges after him and kills one. The last two attacks the fighters but are no match for them. Uraq easily finishes off the last two, not even breaking a sweat. They search through the mushy remains but only finds 1 gold piece. But there is also a door behind the fungi corpses. And after pocketing the gold piece they head for the door. They open the door and find a small blind corridor that is empty except for the very animated zombie that with a moan moves toward them. Without even stopping Uraq steps into the room and cleaves the undead in half. (yes without the blasted bonus - AGAIN). As they can get no further, they go back to the long corridor and take the door at the northern end. They take a short drink and then presses onwards to the door to the east. The door reveals a corridor with a door to the north and to the south. Otherwise it is empty. Wei-Fang points to the northern door and Uraq pushes it open. They enter the room which is lid. much to their surprise. A man was sitting on the floor next to a very small campfire, heating water over it in a small bowl. "Greetings travelers. Come in, enter please. Join me around the fire." The party sits around the fire warming them selves by the flames. He offers to heal them but as they are in perfect health the decline his offer. Instead they share some food with him before they move on. As they move to the door to the north the wanderer tells them that the corridor beyond it has collapsed. Instead they say their goodbyes and press on to the east of the corridor. The room is empty barring a blessed temple giving Wei-Fang a one time +1 against Undead or Demons. The eastern corridor ends blind and they decide to go west instead. They enter a rounded room with 5 centipedes shuffling towards them. Uraq attacks and kills 2 of them quickly followed by Katarina who fells another two. Ichabod misses but Wei-Fang fires off a lightning bolt and kills of the last one. As the room is otherwise empty they gather them selves and move back to the cross road and takes the southern corridor. A giant spider drops to the floor and Uraq, Katarina and Ichabod charges in and quickly dispatches it. Almost as meager as the last spiders result they only find 20 gold pieces. They open the door to the south and turns left through a corridor, revealing a large room with 5 goblins in it. Uraq, Katarina and Ichabod charges them before they know what happens and seconds later the goblins bodies lies scattered and bloodied on the floor. They search their remains and find a gem worth 40 gold pieces. They open the door to the north and after a few steps through a corridor they come upon an armory filled with weapons. They search through the weapons, but end up keeping their own. After that they open the door to the west only to discover that it opens into a collapsed corridor. They begin their journey back through the dungeon to find another way through it. As they move back through the corridors they encounter nothing and begins to relax when suddenly the eeiry sound of vampire frogs hit them. Unable to determine where they come from Ichabod and Wei-Fang is attacked by them. Ichabod fends them off while Wei-Fang takes a hit. Without thinking he lets off a fireball and kills two of the frogs. Ichabod kills another before the last frog attacks him. He deflects the attack and cuts through the frog, killing it. They find some jewelry worth 70 gold pieces. They move back through the corridors without encountering anything further before they reach the yet unexplored corridor to the south. They push open the door and the squeaking sound wakes up two large trolls. The sleepy trolls are taking completely by surprise as Uraq charges in and kills them both with blood splattering all over the floor (D6 + L : 6 + 4 = 10). His friends steps up and makes sure the trolls are chopped properly to death. They find a wand of sleep and hands it over to Wei-Fang. As the room has no other exits they move back through the corridors until they are attacked by vampire bats. After fending them off rather panicked both Ichabod and Wei-Fang fights back easily killing them all. (Ichabod rolled 4 and Wei-Fang rolled 6) Gathering their senses they continue back to the corridor at the entrance and continues east. As they move east and then north they come into a room with no other exits. At one corner a sleeping Ogre rises and smiling lets his big club fall expectantly into his hand. Uraq and Katarina wastes no time and charges the beast. Uraq hits the ogre (LP:6), while Katarina misses. Ichabod also charges in a hits the ogre (LP:5) Wei-Fang points his hands at the Ogre and lets loose a lightning bolt hitting the ogre square in the chest (LP3 => L4). The ogre (now level 4) attacks Uraq who barely manages to deflect the forcefull blow. Not finished with the attack the ogre charges Katarina, but also fails to hit her. Uraq counters and draws a deep cut across the ogres chest (LP:2) that makes it stagger backwards into a hit from Katarinas deadly mace (LP:1). Stunned by the heavy blow its easy for Ichabod to finish the ogre off letting the heavy body fall to the ground with a heavy sound. They search through the ogres belongins finding 100 gold pieces and pockets them before heading out of the dungeon with a somewhat disappointed Wei-Fang who found no sign of the "Book of Eternal Death"
I was rather lucky throughout the adventure with very few monsters attacking me. Also heading back out were very sparse on wandering monsters so felt more or less like a walk in the park. I actually started this adventure some time ago, but severe illness in close family and changing job took me away from it. The next adventure will probably be an attempt of the Cave of the Kobold slavemasters to try and see how fixed adventures will work. After that - who knows - onwards into the unknown. I am pretty sure I will take Wei-Fang and his friends to new dungeons, perhaps with some monsters that will be a challenge for their level. I couldn't resist getting 4 Against Darkness when Andrea announced it. It took some time before I had time to give it a read and subsequently a test drive. I created a classic warband of a wizard, warrior, cleric and a rouge and set of to the dungeons. And here was the first mistake. The rules say that one should go for 20 by 28 squares which will soon see your dungeon hits its borders, but did I read that section. NO!!! I just started at the bottom of an A4 paper and dove into it. By some lucky rolling of the dice, leveling at the right times and finding an extra exit to the dungeon really is what carried my through. 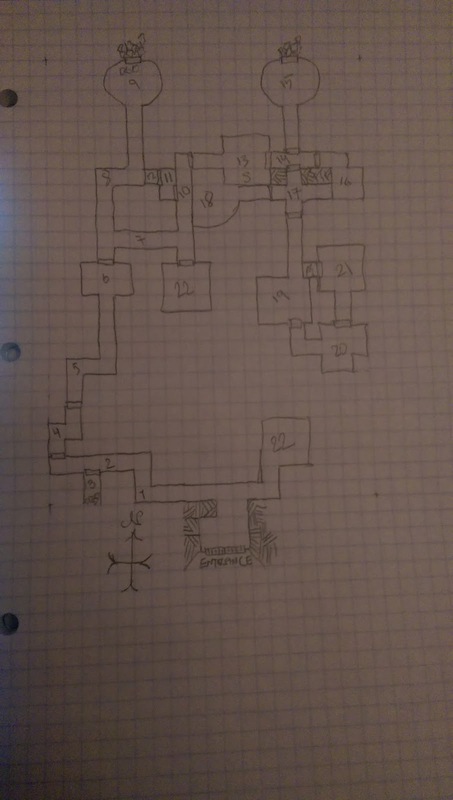 I managed to go through 42 rooms or corridors and thus this writeup of the game is rather long. I have not included all the dice rolls, but only some of the important ones. 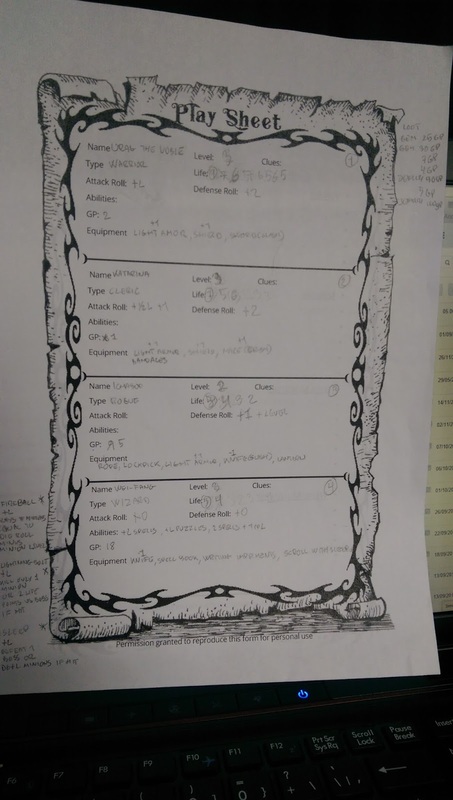 I have added both my character sheet and my dungeon. But as you can see that I track loot and other stuff here, the charachter sheet only had most of the start up stuff and then level and lifepoint changes. Two things worth noting below. I may have forgotten that characters can't switch place during combat and thus have had Uraq and Katarina end up fighting wandering monsters in corridors, but I know that at least most of the final part of the adventure I did it correctly. 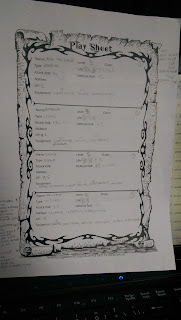 Also as you can see on the Effects and stats tally that I kept forgetting that more and more of the party had a one time +1 bonus against undead or demons. Rather than just remove them anyway after hitting undeads I have kept the "blessing" alive and I may decide to carry them over to the next dungeon. Otherwise I think I got most of the rules correctly - and if I didn't - I had fun, which is the most important part. Sorry for the loooong post ;) the next one will be a bit shorter, I promise! At the end I have jotted down a few notes I made during the game. All in all this has been the most fun I have had in a long time. The rules are simple but as I write in the end, sometimes stuff is described in multiple places so you need to have given it a proper read through so you don't forget some life saving rule. Also, Andrea, the father of 4 Against Darkness is running a competition you might want to participate in. "4AD Competition! Win LIFETIME products. To enter, you must purchase a copy of 4AD through Ganeshagames.net and write up one or more playthrough reports of the game, and publish them on social media (Facebook, Twitter, G+, etc) or on your gaming-related blog. The more reports you write, the more chances you get to win. Unleash your purple prose and tell us about the glorious victories or the rotten luck of your heroes. Post photos of your completed dungeons on Instagram! Use the #4AgainstDarkness hashtag and always add a link to the product page. Make sure that each report includes a link to the product on Ganeshagames.net and send an email to andreasfiligoi@gmail.com to let us know of it. The competition ends on May 24th, Andrea's birthday. On the 25th (2016), Andrea will put all names in a hat and draw a winner who will get a LIFETIME SUBSCRIPTION to all 4AD products (or a minimum value of $50 in other products should 4AD be discontinued). That's it: the winner will receive for free every new adventure or supplement we publish for 4AD." Wei-Fang a young wizard soon to graduate from the order of the Whitestar. 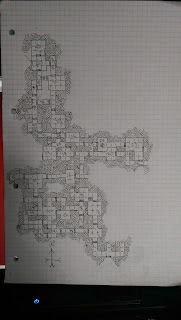 As one of his final tests he must lead a band of adventures into some nearby dungeons and clear it of monsters. At a local inn Wei-Fang meet a group of friends sitting at a table drinking and eating. He offers the trio an equal part of the treasures they may find in the dungeon and after a short negotiation they agree to follow him. After buying supplies the four adventures head of to the dungeons. Slowly advancing into the darkness, Wei-Fang turns on the latern. The flickering light doesn't seem to chase of enough shadows, but it is all they got. A tunnel leads straight ahead while one goes east and another goes west. After looking both ways, Wei-Fang decides on taking the west bound tunnel. After a short turn north they come to a door. With a deep breath Wei-Fang nods at Uraq the warrior and he opens the door to a small room. ## 1 - Room - a L5 Troll appears. They all step into the room somewhat nervous about the the endeavour. The room appears empty until Wei-Fang as the last enter the room with the lantern only to reveal a sleeping troll only now rising to the sound of the intruders. Seeing Wei-Fangs misserable attempt at magic, Uraq draws his sword and charges into battle, killing the troll with a single cut to the throat. Ichabod followed up with some effective troll slicing of its head to pulp, making sure it would not return to life. Moving west through the door the enter a corridor and at one side discovers a small blessed temple. Uraq gains +1 on Attack against undead monsters or demons. Katarina takes her mace to the last centipede but fails to do any damage as does Ichabods knife. The centipede bites at Uraq but fails do damage him (defence roll totalled 4). Finally Wei-Fang manages to make a lasting fireball and burns the last centipede to crisps (Roll of 4 + 1L). Sadly, killing vermin doesn't add to the minion tally. They press onwards to an empty Y section and choses the left corridor. It twists and turns until it ends at a dead end where the walls have collapsed. Still a bit shocked after the centipedes attack they forget to search the empty corridors and instead backtracks to the first room (I also forgot to roll for wandering monsters while backtracking). They open the door to the north only to discover a minor dragon. The party decides to see what the dragon will do and it slithers up on its forepaws offering to be bribed. Alas the warband has not enough gold nor magic items to offer and the dragon attacks Uraq who easily defends the attack (6+6+6+2 + 2 bonus for at total of 20) The now angry dragon turns to Katarina and attacks her with the same result (5+2 for a total defence of 7). Wei-Fang fires of a lightning bolt (6 + 5 + 1 = 12 damage) and knocks 2 life points off the dragon. Uraq follows up with a failed attack (4+1) and soon after Katarina joins with her own failed attack. Somewhat nervous Ichabod made an attempt at harming the dragon as well but failed the already difficult task. (He rolled a 1, needing a 6 in order to get a further roll that would allow him to go above the 6 needed for harming the dragon). The dragon rushed to attack Uraq making a nasty wound with one of its claws. Katarina fended of its attack easily (6+1+2). Both Ichabod and Wei-Fang failed their attacks. Not the best combat party it would seem. The dragon drew in its breath and unleashed its fearsome dragonbreath upon the party. Only Uraq manage to escape the fire, all the others was burned by the fire. Everyone was shocked by the dragons fire and noone managed to get a hit in on the creature. Uraq viciously defended against the next attack but Katarina wasn't so lucky and she too got a nasty cut by the large claws. Still shaken by the dragons attacks almost everyone failed to harm the dragon, only Wei-Fang managed to score a hit (rolled a 6 which ended up as a 5, but rolled again and got a 2 thus ending on 7). A crucial hit as the the dragon is now reduced to level 5, hopefully making it easier to defeat. The dragon however decides that enough is enough and hastefully leaves the room while the party sinks to the floor utterly exhausted by the fight. Treasure rolls (with a +1) gives 2,4,3 for 2d6 gp (7), a gem worth 30gp and a scroll with a Random Spell (sleep). The party exits the room by the norhten door, follows the corridor to the west and enters a room with 7 rats. Uraq charges in and in one big swoop with his sword kills all the vermin in one go. Happy to see the enemies gone so quickly the party opens the southern door to reveal a crossroad. The road to the east is blocked and the party moves further south. The corridor ends blindly but 9 goblins (L3) have been resting at the end and they have heard the party coming and immediately attacks. Both Uraq and Katarina easily defends against the onslaught. Uraq misses his attack while Katarina kills one goblin. The goblins attack Uraq and Katarina again but once more is easily deflected. Uraq kills 2 goblins and Katarina kills 1. With 5 goblins left, they attack again but are repelled by Uraq and Katarina. Uraq kills 1 goblin while Katarina misses. With more than half the goblins killed the party hoped they would flee, but as the corridor is blind they have nowhere to run but through the party. Once more the two fighters defends them selves against the goblins and then counter attack each killing 1 goblin. The last two goblins attack but stand no chance and Uraq cuts down the two last goblins. The goblins held a meager treasure of 4 gold pieces, but the party didn't even break a sweat. Ichabod manages to escape unscathed, but Wei-Fang takes at hit. Ichabod counter attacks and inflict a wound on the medusa. Wei-Fang cast a sleeping spell on the Medusa ending the battle. They find a piece of jewelry worth 90 gp and continues west through a new corridor. 3 level 3 fungi folk appears but Uraq makes short work of them with a devasting attack (6 + 4 + 1) and amongst their remains 5 gold pieces are found. Uraq charges and kills 3 zombies (6 + 4 + 1) and Katarina storms in to finish the last three (6 + 3 + 1). Sadly the undeads holds no treasure. They move back to the previous room (#11) only to encounter 8 (L3) goblins. (They should have been attacked from the rear as they were wandering monsters, but as the party just left the room I count it as a frontal attack.) Uraq charges the goblins and slays one and Katarina follows up slaying another. Ichabod drops another while Wei-Fang fumbles with his knife and completely misses the goblins. The goblins counter attack but everyone keeps them at bay, even Wei-Fang being attacked by two goblins. Uraq and Ichabod works together and kills off two more goblins. Katarina and Wei-Fang also attacks but fails to inflict any damage. 5 goblins down only makes the last 3 more determined to kill the party and they attack with a vengeance, but to no avail. The party easily fends them off and Uraq counters with a wide swing killing two and Katarina crashing in the skull of the last goblin. Except for a Random Spell (escape) they find nothing of value on the goblins. The party goes south from the room and enters a long and winding corridor. Coming around a corner they discover another Medusa. Tired from all the battle they wait to see what the Medusas intentions are. She speaks in a booming voice offering them a quest. She instructs them to slay all the monsters in the dungeon (6:Slay all the monsters). The adventurers accept the quest and presses onwards through the tunnel. As they come around a turn the discover a door to the north and open it, revealing a large room. As the party enters the room four skeletons moves against them from the shadowy corners. Katarina charges in with her mace and crushes two skeletons to death (5 + 2) Uraq follow up but stumples on the way (1 + 1). Ichabod moves around Uraq and finishes off the last two skeletons (5 + 1). The room holds a few sarcophagus perhaps where the skeletons came from, but otherwise nothing of value is found. On the northern side of the room two corridors extend east and west, each blocked by a door. They discuss which way to go and decide to go west. ## 15 Corridor - Empty. The corridor is empty and after a turn south it ends blind. The party goes back to the room once more to follow the eastern corridor. The corridor continues east, but theres a t-section to the north wich they decide to follow. At the end theres a corridor going east and west and they move to the west. They enter a small room which at first appears to be empty, but a sound in the opposite corner makes Wei-Fang lift the lantern and they all take a step back at the sight of a giant spider crawling down the wall and onto the floor. Uraq steels himself and charges the monster but fails to do any damage. Katarina is also too scared to hit the fearsome beast. Neither Ichabod or Wei-Fang manages to hurt the beast either. The spider attacks Katarina and Uraq but also fails to hit them at all. Both fighters strike back, but again fails to damage the spider. Wei-Fang pulls out his scroll of sleeping and after a short chanting the beast slumpers to a still on the floor where Uraq and Katarina finishes it off. They find 100 gold pieces and a scroll with a new spell on it (protect). Wei-Fang takes a zip of water from his flask and looks at his new friends. Hesitantly he asks them wether they should continue and try to fulfill the quest given to them by the medusa or if they should call it a day and retreat to the outside. After a short discussion they decide to try and fulfill the quest. Wei-Fang smiles at their curage and points to the door to the west. "Lets go then." Uraq opens the door and enters a room with no other exits. The room is empty, but Wei-Fang finds it a bit odd and tells them to search it. They begin a more thorough search but after a while Wei-Fang must face the fact that the room is empty. They move back through the previous room and out into the corridor and continues east past the t-section until they enter a small room. Wei-Fangs lantern reveals 5 skeletons scrambling towards them. Katarina charges them but only crushes one, while Uraqs wide swing with his sword drops two. Ichabod gets behind the last two skeletons and finishes them off. Knowing the skeletons rarely possesses anything of interest they press forward through the door to the east. The door opens into another corridor and after following it around a corner Uraq and Katarina stands face to face with 4 Hobgoblins. They look at each other and sighs before charging the enemy. With a scary sound Katarinas mace crushes the skull of one and the blood spews from a deep cut in another Hobgoblin as Uraqs sword finds its target. The remaining Hobgoblins charge to avenge their fallen comrades but both Uraq and Katarina fends them off easily and pushes forward in a counter attack and a few seconds later they stand amongst the corpses of four Hobgoblins. Much to their suprise the hobgoblins actually have some treasure. A lot of gold which Wei-Fang quickly determines is Fools Gold, magic gold that will help them bribe the next monster that asks for it. The continue around a corner and enters another part of the corridor. It continues east but also have a door to the north and to the south. On the floor they find a staff and hands it of to Wei-Fang who after a few minutes of investigation proclaims that it is a fireball staff. He smiles broadly as he now feels he can properly participate in the fights again. Wei-Fang points to the door to the north and Katarina opens it with Uraq ready to enter first. As the party enters they see that it is a large room the has a bend to the east further north, and they can't see how large it is around that corner. On the eastern wall they see a door and begins to move towards it when 7 goblin swarmlings come charging around the corner. Uraq kills three in one go and Katarina kills two which causes the final 2 to flee. They find 10 Gold pieces on the floor amongst the swarmlings possesions. Wei-Fang moves around the corner of the room and sees another door that leads west. The party moves through it and into a long corridor that ends in a small room with a statue of stone in the middle. Depicting a warrior Uraq moves to touch the statue. As he lays his hand on the statue it begins to move towards him while its stonehammer drops a bit. Uraq immediately attacks the statue hitting it hard. Katarina follows up with an attack of her own. Ichabod fails to hit the statue but Wei-Fang manages to cut deep with his knife (he rolled a 6 + 6 + 6 + 3, so much I feel that he should have taken more than just the one life point from it). The statue attacks Uraq and hits him hard on his shield arm. The party attacks again but noone manages to hit the mean looking statue. Looking around it hammers at Katarina, but she deflects the attack with her shield before they attack again. Uraq lands another hit on the statue (2 out of 6 lifepoints left so the statue drops to L3). Katarina and Wei-Fang misses again but Ichabod gets another hit in before it attacks Uraq. He barely manages to fend it off and then he rolls to the side and rises in one motion with the sword cutting through the statues neck dropping it to the floor where it shatters to pieces. Amongst the stone pieces they find 140 gold pieces, certainly the trip has been worth its while. If only they can make it back to the surface again. After catching their breath, the open the door to the west. They enter a t-section with another door to the west and a blind tunnel to the south. There is a small blessed temple and Katarina gains a one time +1 against Demons or undeads. They spend some time examining the dead end for secret doors or anything else interesting but find nothing. Then they continue west through the door. The corridor extends a few steps from the door then turns right into a small room. All of a sudden the light from the lantern dims and the room grews colder and an almost transparant shape of a woman in a torn gown appears. She opens her mouth in a scream that can never be heard before she flies through them. Uraq and Katarina staggers while Ichabod and Wei-Fang drops on their knees clutching their chests. Katarina and Uraq tries to help them but they seem to be damaged somehow by the ghost. After some time they get back on the feet, visibly shaken from the encounter. After steeling their nerves with some water and food both Wei-Fang and Ichabod are ready to continue. They open the door to the west and enter an empty corridor that extends further west. There's a door to the north and south and Wei-Fang nods tired at the shouth door. Uraq shoulders the door open and surprises 4 hobgoblins sitting around a table. He kills one and then Ichabod quickly rushes past him and takes out another. The two others evade the attacks from Katarina and Wei-Fang. The last two hobgoblins attacks Uraq and Katarina and gets a hit in on each before they counter and kills the hobgoblins. They rumage through the hobgoblins belongings and find a Wand of Sleep. As the room has no other exits they go back into the corridor and opens the door to the north. They enter the room only to be greeted by a pair of dragons eyes reflecting the light from the lantern. Uraq charges to the attack right away (6 + 6 + 5 + 2), followed by Katarina who fails to hit the dragon. Ichabod also fails to hit the dragon but it slides to the floor sleeping when Wei-Fang uses the newly found Wand of Sleep and pacifies the beast to be slain completely by Uraq and Katarina. They find two scrolls with lightning bolt spells adding them to Wei-Fangs rather large stash of spells. They also find a potion of Healing which goes into Katarinas backpack. Then they turn their heads to the door at the northen end of the room, readies their weapons and opens it. They follow a long corridor that ends in a fairly large room that is obviously a blessed temple. Ichabod now also has a one time +1 against undead or demons. The party is somewhat weary, but after a short discussion decides to continue. They open the door to the north. They open the door into a corridor that ends blind to the north, but has another door to the east. Otherwise the corridor is empty. Wei-Fang decides they should search the corridor a bit more before continuing. Heurka! Opposite the eastern door they find a secret door and opens it. The room is a large square room with a door to the south and another door to the east. They open the door to the east and sees ... stars!!! Outside there is a lot of bushes and other vegetation covering the door. They take a deep breath and takes in the fresh air before they look at each other again. Wei-Fang takes the word. "So my friends, it seems we have a new exit from the dungeon. Should we take it and abandon the rest of the dungeon and our quest or should we press on and see what we find?" The three others takes only a short time to discuss it and Uraq answers. "Lets continue, we can always use this room as a fast exit if we get too hurt. Be we are all in fairly good shape as it is." Satisfied Wei-Fang nods and then asks them to search the room while he closes the door to freedom. After some time they discover another hidden door to the north and opens it up. Uraq opens the door and notices the smell of hobgoblins so he charges into the room and kills one of them. Katarina takes the other flank and smashes the skull of one hobgoblin with her shield before letting her mace replace the skull of another. Neither Ichabod or Wei-Fang manages to do the fast hobgoblins any harm. Uraq fends off a hobgoblin, but Katarina is not so lucky, her attack on the two hobgoblins made her vulnerable to a third that now gives her a large wound. Uraq quickly steps in front of her and kills the hobgoblin while Ichabod slips behind the two of them and kills of the fifth enemy. Katarina regains her posure and with a back hand swing with the mace splatters the last hobgoblins head onto the wall behind it before she falls on her knees and breathes heavily. While she pops out the potion of healing and drinks it the others begin to search the hobgoblins belongings finding a gem worth 75 gold pieces. After bagging the gem, they return to the exit room and opens the southern door. They enter a corridor that has a door to the east and at the far end a door to the right. Otherwise it ends blind. They open the door to the east first. ## 35 Small corridor - Empty and blind. Opening the door reveals a small corridor with no other exits. Wei-Fang is convinced that there must be a secret door or something. But the only thing they find is a loose brick hiding 140 gold pieces. With a terrifying whaile a ghost (L4) appears. Katarina immediately tries to banish the tortured soul and without doing any damage besides a few shattered nerves the ghost disappears into the wall again. They go back to the corridor again, this time going for the door leading west. They open the door into the middle of a small corridor and startles 6 orcs eating in the northern end. Uraq charges them closely followed by Katarina. The first orc manages to block Uraqs attack but the other one is killed by Katarina. The orcs counter attack and hits Uraq while Katarina blocks the attack with her shield. Two more orcs drops to the floor as the duo attacks again. Both Uraq and Katarina blocks the next attack and goes in for the kill dropping two more orcs leaving only one who flees the battle. They find 6 gold pieces amongst the corpses and then continues south through the door. As they open the door 6 hobgoblins appear, Uraq and Katarina sighs and readies their weapons before they charge in. Their battlecries startle the hobgoblins and shortly after 4 of them lies dead on the floor (Uraq : 5 + 3, Katarina : 6 + 3 + 1) The remaining to hobglins roars in anger and charges their friends banes. But anger doesn't get them past Uraq and Katarinas defences and another hobglin dies by the hand of Uraq. The last one attacks Uraq, but he blocks the attak with his shield before running his sword through the hobgoblins stomach. They find another scroll with an escape spell on it and Wei-Fang stuffs it in his wizards robes for later use. ## 38 Corridor - Empty - Blind/collapsed. They open the eastern door only to discover an empty corridor that has collapsed completely at the end. They close the door again and opens the door to the west instead. The adventures proceed down the corridor turning right a the t-section and discovers 7 fungi folk at the end of a collapsed corridor. Once more Uraq and Katarina charges into the attack. Uraq kills two and Katarina kills one and then a fireball sizzles between them killing three more and the last fungi quickly makes it escape. Amongst the mushy remains they discover a mace which Wei-Fang quickly determines is magical. (+1 attack.) He hands it to Katarina who replaces her trusty mace with the new one. The leave the dead end and goes back to the corridor to continue south. The door opens into a y-section. The sound of the screaking door makes 5 orcs turn around to face the adventurers and the charge of Uraq and Katarina. Before they realise what is going on two orcs lies dead on the floor. The now hardened warriors easily fight of the counter attack and kills two more orcs and happily sees the final orc makes it escape from the attackers. On the floor they find a gem worth 110 gold pieces. They take the left corridor and enters a corridor that leads east. Going to the end they realise that they have returned to the corridor before they met the last dragon. But their hardships aren't over. In the corridor they discover a Catoblepas and all but Uraq is shocked by its gaze. The beast attacks hitting Wei-Fang who staggers to the floor. Panicked he reads out a firebolt spell which causes the beast to halt in its tracks. Ichabod charges the beast and inflicts a wound (dropping it below 50% health). The beast attacks Wei-Fang again, but he manages to back away from it. While the beast is occupied with Wei-Fang Ichabod manages to get behind it and slits its throat dropping the dead creature just beside Wei-Fangs mortally wounded body (1 life point left though).They find a gem worth 150 gold pieces and add it to their loot bag. Katarina kneels beside Wei-Fang and studies his wounds that has taken a toll on his fragile wizards body and decide to call upon the gods to heal him. Vigorated he stands up again, thanks Katarina heartfully and brushes the dust off his robes. They go back to the previous corridor and opens the door to the south revealing a collapsed corridor and 5 Goblins. Uraq roars at them and charges into the tunnel and kills 4 goblins in a single blow (6 + 5 + 3). The remaining goblin pannicks and slides through the legs of the party and bolts away in the corridors. As he flees a gem drops to the floor and the party picks it up putting it in their bag (once more I rolled 140 gold pieces, which seems to be the running rate for gems.) They go back to the corridor (#41) and then the y-section (#40). 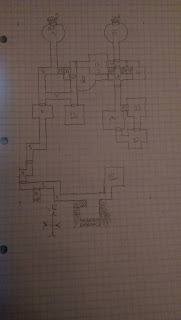 They are just about to take the westmost corridor of the y-section when they are attacked by an orc brute, most likely the leader of the orcs whose corpses still adorns the floor. Ichabod manages to evade the blow, but Wei-Fang is not so lucky and once more his blood begins to flow. Ichabod tries to attack the brute but fails to do any damage. Wei-Fang points his fingers at the large creature and a lightning bolt hits it square in the chest. When the brute attacks them again they are better prepared and the orc misses them both. Ichabod counter attacks and draws blood to match up with the damage done by Wei-Fangs lightning bolt taking the brute to below 50% health. Wei-Fang once more points his fingers at the brute and the huge orc falls over, sleeping. Uraq steps in to hack its head off before the spell wears off. They find a gem worth 40 gold pieces. With the amount of dungeon dwellers turning up all the time they decide to head for the last exit they found. There are too many corridors and doors left to investigate in order to fulfill the quest given to them by the Medusa anyway. As they move north through the corridors they are suddenly attacked by 3 hobgoblins but both Ichabod and Wei-Fang manages to evade the blows. Tired of all the combat Wei-Fang throws a sleep spell on them, ending the battle when all three hobgoblins fall asleep on the floor only to be finished off by the rest of the party. They find yet another scroll with an escape spell on it and Wei-Fang bags it as usual. They press further north and reaches the room (#32) with the exit without further encounters. Tired but glad to be alive (and not having to retrace the entire dungeon to get out) they head back to the village and Wei-Fangs order of magic. The morning sun begins to appear when they enter the village. Wei-Fang leaves his three friends at the inn for a well deserved breakfast while he goes back to his school to see if he has passed the ordeal even though they didn't clear the dungeon of monsters.